I have more than one, but that's only because I'm not the only one in my family that likes to take a whole lot of pictures. 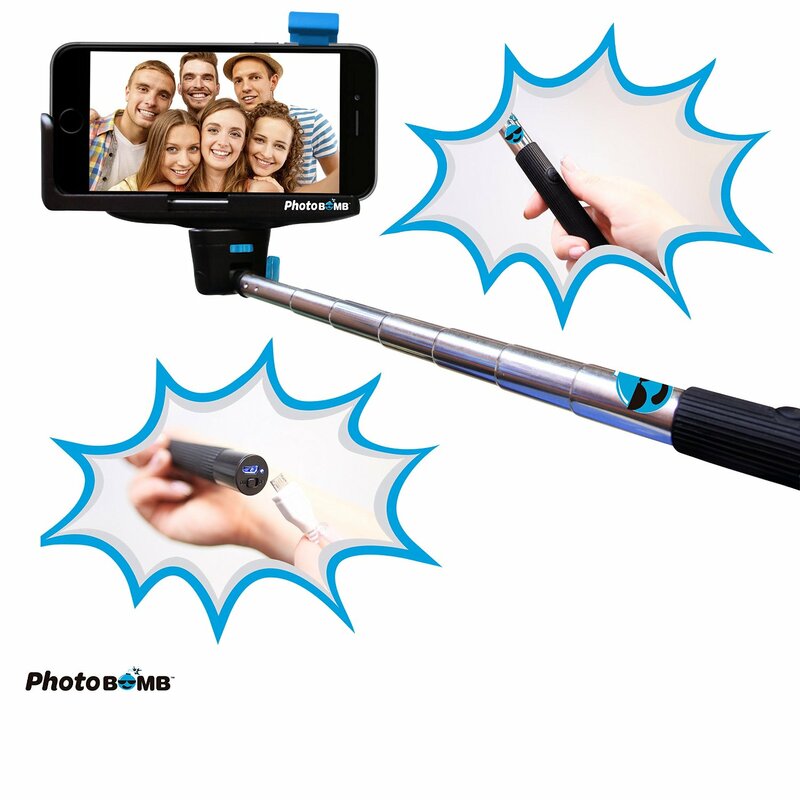 This post is specifically about my PhotoBomb Selfie Stick. After trying several out, I've quickly learned that the best ones have a Bluetooth function on them, and yes, this one sure does. It's just easier and way more convenient when you have the ability to sync the stick to your phone and then push the button and take your photo. No reaching out as far as you can with your arm---which in my case is not very far. I have pretty short arms. No need to set a timer on your phone, and not all phones have that option either, so no need to go through the trouble of downloading a timer app either. Just extend the stick as far as it can go, and it can go quite far, and push button. The mount can be adjusted bigger or smaller depending on how big your phone is. It can support the weight of your phone and it doesn't flop over. What fun would it be if it did?? Oh my gosh that would be such a pain in the you know what. As for accessories, it comes with a quick charging cable. You can push it back down to size and stick the whole thing, along with the cable in your bag. Sadly, it doesn't come with instructions, or at least mine didn't. However, it really wasn't hard for me to figure out how to use it since I'm tech savvy, and as mentioned above, I happen to have a few others that I already learned how to use. You can purchase your device here. Don't forget to visit them on Facebook.